Kitchy Pizza Cutter Wheel Just $12.99! Down From $20! You are here: Home / Great Deals / Amazon Deals / Kitchy Pizza Cutter Wheel Just $12.99! Down From $20! Check out this great deal at Amazon! Score this Kitchy Pizza Cutter Wheel for just $12.99 down from $19.99 PLUS FREE shipping with Amazon Prime or for orders over $25! With this pizza cutter’s unique design and super sharp grade 430 stainless steel blade, you can cut pizza with very little effort. What’s more amazing is that this item does so much more than just cutting pizza! Chop, slice, mince and scoop, you’ll find so many uses for this pizza cutter in your kitchen, from cutting herbs to slicing up bars and brownies, the possibilities are endless! Pretty cool! SLICE ANY PIZZA LIKE A PRO – This pizza cutter will leave you shocked with how easy it is to get a nice, clean cut through your pizza. With its ergonomic handle and flawless finish, you won’t have to cut back and forth and you get to keep your toppings where they belong – on your pizza. SUPER SHARP AND FITS IN THE PALM OF YOUR HAND – Why waste money on bulky pizza rockers that don’t even fit in your kitchen cabinet when you can simply get this unique design that easily fits in your hand and also in your cutlery drawer. 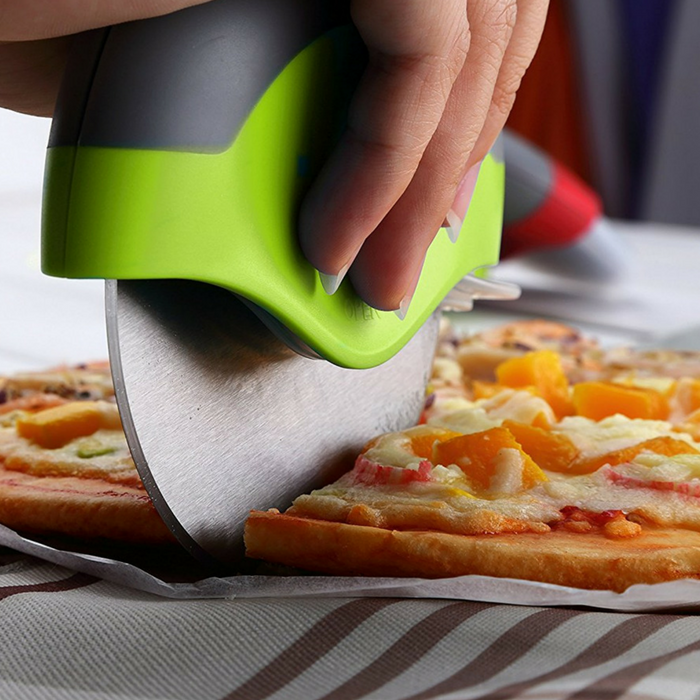 BRILLIANT DESIGN THAT PROTECTS YOUR HANDS FROM CUTS – Unlike those old fashioned handled pizza cutters, this little but yet powerful pizza slicer has a protective blade guard that you can easily close when it is not use. Never worry about your kids getting their hands cut again. SUPER EASY TO CLEAN AND DISHWASHER SAFE – Cleaning this pizza cutter wheel couldn’t be easier. It can be easily dismantled for both manual or dishwasher wash (take a look at the product images to see how it works). You also don’t have to worry about getting hand cuts like those traditional pizza cutters with handle.